Golden can be accessed by car, trail or rail. There are five major highways (I-70, Hwy 6, Hwy 58, Hwy 93 and C-470) that lead to Golden. No matter if you are coming from the East, West, North or South, Golden is conveniently located at the foothills of the Rockies just 20 minutes from downtown Denver. Map your route to Golden using Googlemaps. Golden can also be accessed by trail via the Regional Clear Creek trail system or the C-470 Bikeway. Cyclists can also use designated bike routes on 32nd Avenue and 44th Avenue. Golden has a designated north-south light railbike route on Ford Street. Remember rules of the road apply to cyclists. Visitors to Golden can travel from Denver and DIA to Golden via the West Rail Line or “W” line. The West Rail Line between Golden and Denver Union Station passes through 3 fare zones, so the price for a single, one way ticket between Golden and Denver is currently $4.00. (Express ticket price) Student and senior discounts are available. Transfers are provided when requested. Transfers can be used between the light rail and bus service. If you travel from Denver to Golden on the light rail, a transfer will allow you to continue your journey into Golden via bus for no additional cost. The same applies if you start on a bus and transfer to the light rail. Bikes are also allowed on the light rail. Once you arrive in Golden on the “W” line, you can either walk, bike, ride or taxi to downtown Golden depending on the time or day of the week. You can walk or bike the 6th Avenue Trail or travel through town along Johnston Road to Ford Street. The total distance is about 2.5 miles and can take up to 1 hour. Bike rentals are available at local bike shops. Visitors can also call Denver Yellow Cab at 303-777-7777 for a fee or use UBER or LYFT apps to get around. FlexRide is a personalized bus service that travels within select RTD service areas. 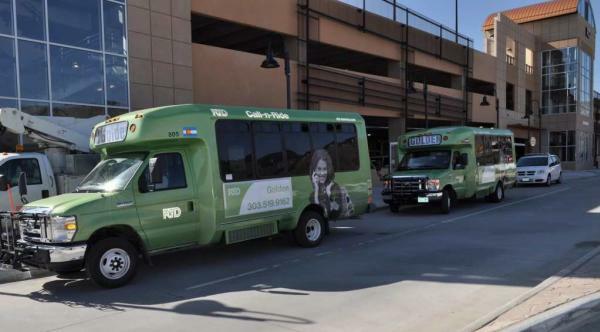 Anyone can catch FlexRide to connect to other RTD bus or train services at stations and Park-n-Rides, or get direct access to shopping malls, schools, businesses, recreational centers, libraries and more by booking a trip online or going to a designated stop on one of our flex routes. Fares for flexride are $3.00 for locals, $0.90 for youth. Discounts can apply. The flex routes offer commuters a reservation-free ride during morning and evening rush-hours at scheduled stops and times along the route. Just wait at any designated FlexRide stop and they&apos;ll pick you up. When using their online reservation service, you can also use our subscription service to schedule recurring trips at the same time and location. Once you’ve subscribed we’ll pick you up and drop you off on your schedule until you cancel. Hours of Operation are Monday-Friday from 5:30 am to 8:00 pm, Saturday from 8:00 am - 7:00 pm and no service on Sundays and holidays. Check out the map of the service area and view stops below. For more flex route information visit the RTD website. To schedule a ride on the FlexRide service or to ask questions, call RTD at 303-519-9162. Please visit the RTD website to view the full FlexRide Bus Schedule. The Bus is a great alternative during evening or weekend hours when the Circulator bus is not in service.